Be the first to share your favorite memory, photo or story of Billie Faye. This memorial page is dedicated for family, friends and future generations to celebrate the life of their loved one. 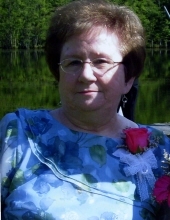 Ms. Billie Faye Sumrell Smith, 77, passed away on Saturday, April 13, 2019 at Vidant Medical Center. A graveside service will be conducted on Wednesday at 2 PM in Ayden Cemetery with Rev. Bob Lane officiating. A native of Greene County, Ms. Smith was born to William and Thelma Taylor Sumrell. She was a graduate of Maury High School and attended Mount Olive College. For several years she worked at the Free Will Baptist Press in Ayden. She was a member of the Ayden Free Will Baptist Church where she had served as Treasurer for a number of years, sang in the choir and served on the Ladies Auxiliary. Mrs. Smith enjoyed remaining active through solving word search puzzles, completing adult coloring book projects and playing Bingo. One of her greatest joys was that of being “MeMa” to her grandson, Noah. A loving daughter, mother and grandmother and sister, Mrs. Smith will be missed by the many who knew and loved her. In addition to her parents, Mrs. Smith was preceded in death by a brother, Bobby Sumrell. The family will receive friends immediately following the service at the cemetery. To send flowers or a remembrance gift to the family of Billie Faye Sumrell Smith, please visit our Tribute Store. "Email Address" would like to share the life celebration of Billie Faye Sumrell Smith. Click on the "link" to go to share a favorite memory or leave a condolence message for the family.